Do you want to know how to Make massive passive income from Google Adsense Advertising Program? Learn how to make money from google adsense. You’ve heard and seen that many people are earning money from internet from several ways. If you ask the Website entrepreneurs, bloggers or affiliates that what is the top way to make money from Internet?. The answer would be Google Adsense. According to google, more than 2 million people get benefits from Adsense. Many people around the world make money with adsense. Because, Google Adsense makes the people to earn regular income from their websites, YouTube Channel and Blog. Earn money from Adsense is the hottest trend and desired lifestyle like us. The massive advertisement program Google Adsense made countless entrepreneurs, bloggers to living with their websites or blogs or YouTube channels. I’ve written this article based on my own experience that I have made more than $36,700.00 , ie Rs.26,02,576.77. I have provided my Google adsense earning proof in this article below. You’re free to ask Google Adsense related questions in the comment section. This article has been completely prepared for beginners who wants to earn money from google. Although, we have given important tips to the experience Google adsense holders to earn more money from adsense. Google Adsense is Ad program which is being operated by a tremendous firm called Google. Google Adsense is a successful and free Advertising service for the website owners or publishers to generate money (monetize) through their website content. A publisher can be a owner of a website or blog owner or You Tuber or some other online host service which can be accepted by Google Adsense policy program. Publishers can easily make money from Google Adsense by placing Google Ads on their websites. Whenever the visitors click on the Ads on your website, you will get paid out of it. Based on the visitor’s country, Ad category and Ad unit size, you will get paid from Google Adsense. Google Adsense program will place advertiser’s ad on your website based on your content and Geo target (your country or target country). According to Google’s current policy, Adsense will share 68% of Ad revenue to the publishers and it will take 32% from the total click value. For an example, if an advertiser pays $2 to Google for a single click on their ad, then publisher will get $1.36 ( Rs. 102 approx) and Google takes $0.64 ( Rs. 46 approx). This is what I would say Google Adsense Ad program is the best way to make money out of your website content and traffic. How much we can earn from Google Adsense Program? I know this is the very basic question that all newbies will ask. I too asked this question when I start learn about Google adsense. Most of the Google Adsense publishers are earning more than $1000 per day. I’m working hard to be among one of those Adsense users. I hope that I will make more than $1000 / day soon. I’m earning decent money from Google Adsense ad network. Below is my earning proof for your reference. I don’t say that I’ve achieved my goal. But I am on the way to reach my goal very soon. Publishers can join for free. Publishers will get 68% and Google gets 32%. No limitations to earn money from Adsense. Google Ads are suitable for Desktop, Tablet and Smart Phone. Your Audience will get right ads. High quality content related Ads. Ads are very easy to Place on your website. Step by Step instructions available to Place Ads. You’ll get continuous Ads from Adsense program. You can control Ad’s appearance. You may control Google Ads Category and color. Real Performance report helps to increase your earnings. Ad testing and experiments labs available. Google Publisher Toolbar and Adsense App to control your Ads. I know that you’re now very much satisfied with Google Adsense ad network and you will like to join with Google Adsense. Let’s see that how to apply for an Adsense program. 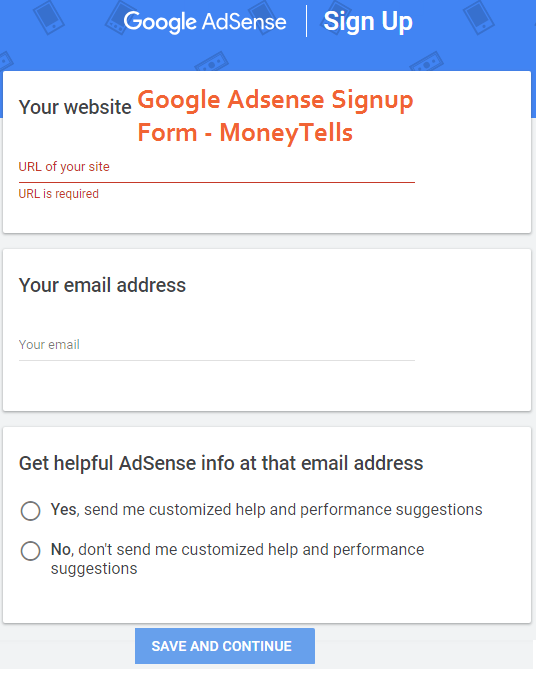 How to apply for a Google Adsense Account? 1. Web property (Blog, Website, YouTube or any source accepted by Google Adsense policy). 2. Registered Gmail Account to apply Google Adsense. 3. Your website should focus on any topics related. Topics can be lifestyle, health, wealth,entertainment, sports, news, beauty, religious, cinema or anything. 5. Minimum 10 to 15 published posts or pages needed prior to apply for Google Adsense approval. 6. If you would like to get Google Adsense approval for YouTube Channel then do upload the original videos in your YouTube Channel. Once you applied for Google Adsense then you need to wait for at least 2 – 3 weeks to get an update from Adsense team. If everything is followed by the Google adsense policy then you’ll surely get approved by the Adsense approval team. Now you’re good to go with placing Google Ads on your websites. What’s next once You’ve Approved with Google Adsense? Alright. Your Adsense account is now ready to use. Let’s place Ad Units in your websites. Text : Google Text ads will use words for advertising. The text ads can be Ad unit (one offer) or it can be a Link Unit (ie. list of offers). These ads will come with various sizes. You’re free to customize the ads units. Images: Graphics Ads are called as Google Images ads. Google image ads are in various sizes. You’ll be asked to choose mixed options as Text and Images ads units. Google Adsense for Search Ad is a Google search box on your website. Google Search Box is the best way to make money with adsense. When an user types text on the Google search box, he / she will get google results page opens with Google Adsense ads. How to Get Google Adsense Payments? Google Adsense pays to its partners as monthly payment. Adsense payment will be paid as direct bank deposit / transfer or check. Make sure that you’ve $100 in your Adsense account prior to receive your payments monthly. Yes. The minimum threshold to receive payment from Adsense is $100. You’ve an option to verify through the report that which Ad units and countries performed well to get money with adsense. It’s very simple formula that how much traffic you drive to your website, the amount you make money with Google Adsense. You need to draw a perfect plan in order to make huge money with Google Adsense. I’ve listed the best ways to make money with adsense easily. Keep in mind you and your website is adhering to Google Adsense program policy and rules. Avoid accidental clicks and do not click on your web page’s Google adsense ads. Do not ask someone to click on your Google Ads. Don’t go for incentive clicks. Do not buy PPC space (Pay Per Click). Go for organic traffic which brings quality users and quality Adsense clicks on your blog or site. Ensure that your blog or website is mobile optimized and responsive. Make sure that you’re using mobile responsive ads, as mobile users are very high. Earlier, you’re allowed to place 3 standard ads placements / page. Nowadays, Auto Ads help you to place the Google Ads on your web page easily. Google Adsense Ads should be placed above the page fold. Keep in mind that you should not quit any emails from Google Adsense program. How to avoid Competitors Ads on your Website? Sometimes, your website content may promote your own products. But you may see some Google Ads which promote your competitors products through your websites or blogs. You can easily prevent these types of Ads offers showing in your blog or site. Google Adsense program helps you to block up to 200 competitors URL or any URL from appearing on your website or blogs. What are the website or blog types to Make Money with Adsense? Do you know, just running blogs or websites with Google Adsense ads won’t make you millionaire. You need to think wisely to generate more revenue with Google Adsense. Let’s read the types of blogs or websites which generate more Adsense ad clicks to make money with adsense. Having regular published topics with fresh and unique content is the best way to earn money with Adsense. We’ve seen many blogs are getting updated hourly or daily. This is the key to generate more money with Google adsense. Regular updates on your blog contents will attract more advertisers to place their Google Adsense ads on your blog. Above the content but under the navigation menus. Left of the blog title. All white-space in your blogs. Just below to the blog content as a form of native ads. Forum or discussion sites are best place to share your thoughts to attract big readers. This will help you to generate more revenue with Google Adsense. Allow your readers or users to interact. This will help to drive more traffic to your blog easily. Be as an authority and make a brand to get the people together to discuss regarding many topics. This way your Google adsense will get more clicks and will generate huge money from Adsense. Greetings! Very useful advice about earn money with adsense. Thanks for this wonderful one by one step instructions.